I think we stumbled on a really good one this time. B and I were trying to decide what we wanted for our cocktail on Sunday when the discussion drifted to a daiquiri made with rhum agricola that was mentioned in Imbibe magazines interview with Rachel Maddow a while back. It’s a great little cocktail and we were trying to decide if we had blogged about it yet (we haven’t). 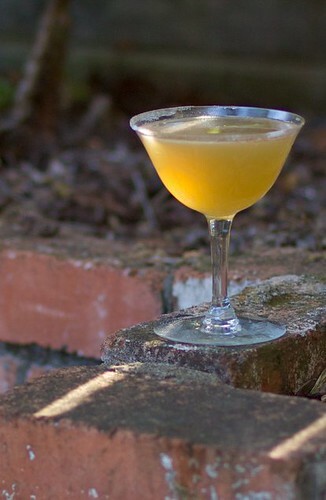 While I was reading through the interview to find that recipe, she mentioned that her favorite cocktails is the Tantris Sidecar from legendary the Audrey Sander’s Pegu Club in New York City. Combine all ingredients in shaker. Shake, strain into a chilled cocktail glass half rimmed with sugar and garnish with a lemon. I have to admit that I substituted Patron’s Citronge for Cointreau, which left the drink a little sweet. It was still very drinkable, but the complexity of the Chartreuse was pretty much lost. Next time, I think we will probably try it with the Cointreau (and possibly just leaving out the simple syrup with the Citronge as well). Even with the slight deviation this is a great cocktail. I think it’s likely earned a spot in our regular rotation. Happened to be googling the Tantris Sidecar and came across your blog. Wow, sorry I have been unaware of it until now! Beautiful pictures. I apparently should pay more attention to approving comments. Sorry about that. I am actually going to do a post on the Bijou and ran across your blog. Nice.